2 158 Korean J Hematol Vol. 44, No. 3, September, 2009 증례환자 : 18세, 여자주소 : 월경과다, 잇몸출혈과거력및현병력 : 환자는멍이자주드는외에특이병력없었으며내원전약물복용력은없었다. 1개월전월경과다로타병원에서실시한혈액검사에서빈혈, 혈소판감소증이관찰되었고내원하루전부터잇몸출혈이멈추지않아본원응급실을통하여입원하였다. 신체검사 : 결막은창백하였고황달이나두경부림프절종대는없었다. 흉부청진상심음과폐음은정상이었고복부진찰에서간비종대소견은없었고사지에서자반은관찰되지않았다. 검사소견 : 복부컴퓨터단층촬영에서간비종대관찰되지않았고 PET-CT와위내시경검사에서특이소견없었다. 내원당시일반혈액검사에서혈색소 5.7 g/dl, 백혈구 2,860/μL, 혈소판 4,000/μL, 교정망상적혈구수 4.19% 였다 (Table 1). 말초혈액도말검사에서정구성정색소성빈혈과적혈구부동증, 눈물방울적혈구 (tear drop cell), 구상적혈구가관찰되는변형적혈구증및유핵적혈구와골수세포 (myelocyte) 가출현한백적아구증 (leukoerythroblastosis) 이관찰되었고 (Fig. 1A, B) 호산구증가증이나호염기구증가증은관찰되지않았다. 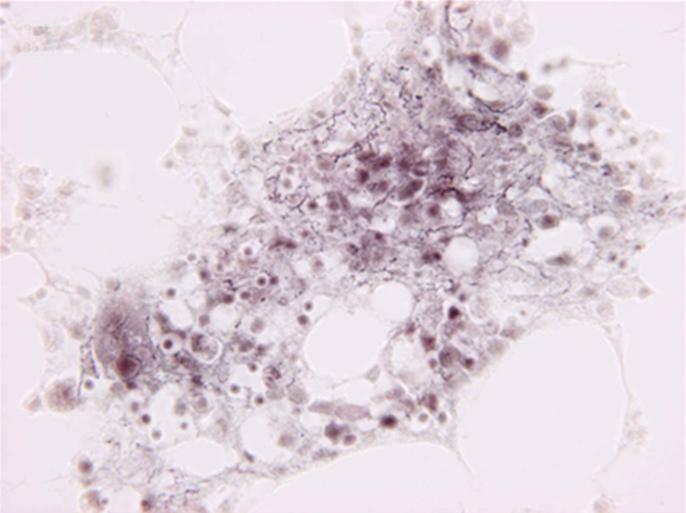 혈청검사에서항카디오리핀항체 (anti-cardiolipin antibody) IgG와 IgM 양성, platelet associated antibody IgG 양성이었고, 류마티스인자 (rheumatoid factor) 는 6.7 IU/mL로정상, 항핵항체와루푸스항응고인자 (lupus anticoagulant) 및항인지질항체 (anti-phospholipid antibody) 는음성이었다 (Table 2). 직접항글로불린검사 (direct antiglobulin test) 양성, LDH 811/IU, CA-125와 CEA 종양표지자검사음성, 유세포분석을이용한발작 야간혈색뇨증검사에서정상소견이었다. 골수검사에서세포충실도정상이면서 (60 90%) 적혈구계와거대핵세포 (megakaryocyte) 증식을보였으나거대핵세포무리나골수이형성은관찰되지않았으며, 림프구증가증이나종양성림프구의침윤은보이지않았다 (Fig. 1C, D). 골수생검에대한레티쿨린 (reticulin) 염색에서산재된거친섬유를동반한미만성섬유망이관찰되고 Masson s trichrome 염색에서아교질 (collagen) 음성으로서 (Fig. 1E, F), modified Bauermeister scale 8) 에따라 Grade 3의골수섬유증으로판단하였다. 골수염색체검사결과정상핵형이었다. 임상경과 : 프레드니솔론 3 mg/kg로치료 40일후일반혈액검사에서혈색소와백혈구수치가정상화되고혈소판수치가호전되었으며, 말초혈액도말에서관찰되던변형적혈구증도감소하였다 (Table 1, Fig. 2A, C). 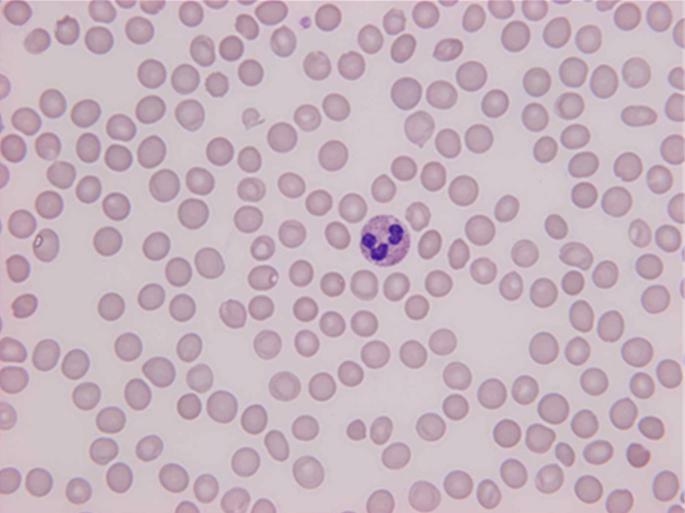 혈청검사에서항카디오리핀항체 IgG와 IgM 및 platelet associated antibody IgG가음성화되었으나, 직접항글로불린검사는양성이었다 (Table 2). 추적골수검사에서각각 Grade 2 ( 치료 40일째 ) 와 Grade 1 ( 치료 4개월째 ) 의골수섬유증을보였다 (Table 1, Fig. 2B, D). 지속적스테로이드치료 13개월후현재혈액검사소견상진단시보다호전된양상보이며외래추적관찰중이다 (Table 1). 고 골수섬유증은 1879년 Heuck 등에의해처음소개된이래다양한질환과의연관성이알려져있고, 1) 원인은크게종양성과비종양성질환으로나눌수있다. 종양성질환에는급성골수성종양, 골수와연관된림프구성종양, 형질세포질환과악성종양의골수침범등이있다. 2,10) 비종양성원인에는 SLE외에드물게쇼그렌증 찰 Table 1. 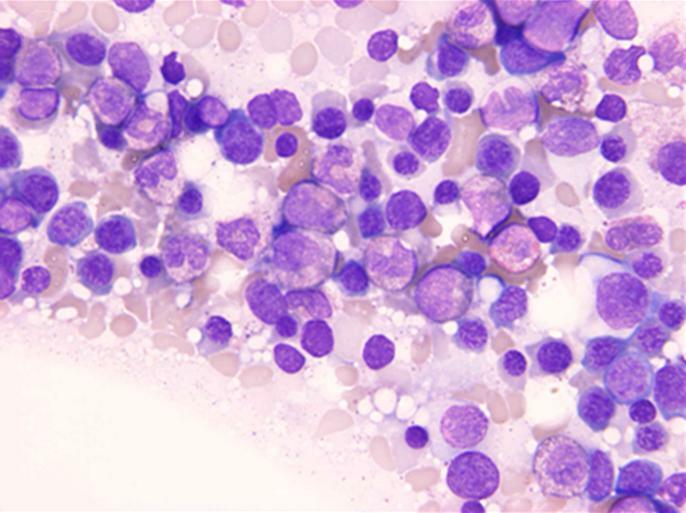 The changes of CBC, blood smear findings and bone marrow fibrosis after steroid treatment Pretreatment After 40 days After 4 M After 13 M Hgb (g/dl) Hct (%) WBC (/μl) 2,860 4,280 8,480 10,180 Platelet (10 3 /μl) Tear drop cells/hpf* Spherocytes/HPF Leukoerythroblastosis + BM fibrosis Grade 3 Grade 2 Grade 1 NA Abbreviations: M, months; BM, bone marrow; NA, not available. *Under 1,000 magnification, Modified Bauermeister scale. 3 박순호 외: 원발성자가면역골수섬유증 1예 후군, 피부근염, 원발성담즙성간경변, 궤양성대장염, 3-6,11) 결절성다발동맥염 같은 자가면역질환과 그외바 이러스감염, 신성골이영양증, 비타민D결핍증, 갑상선 159 2,12) 기능이상과도 연관되어 있다고 알려져 있다. 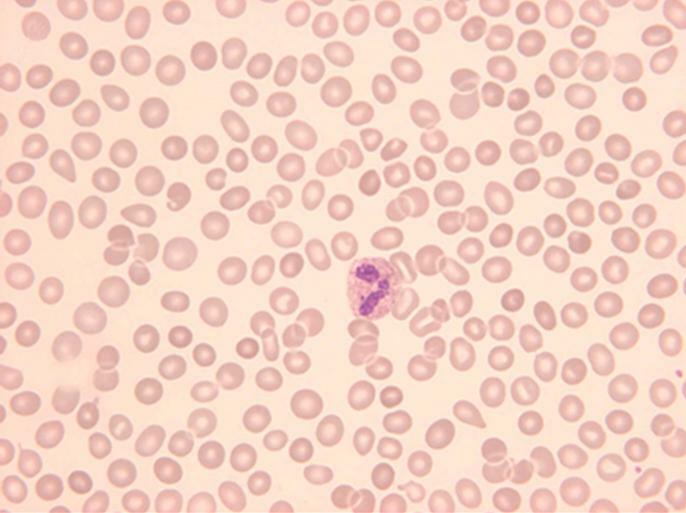 골수섬유증의 가장 흔한 원인은 골수증식성종양의 하나인 원발성골수섬유증(primary myelofibrosis)으로 Fig. 1. 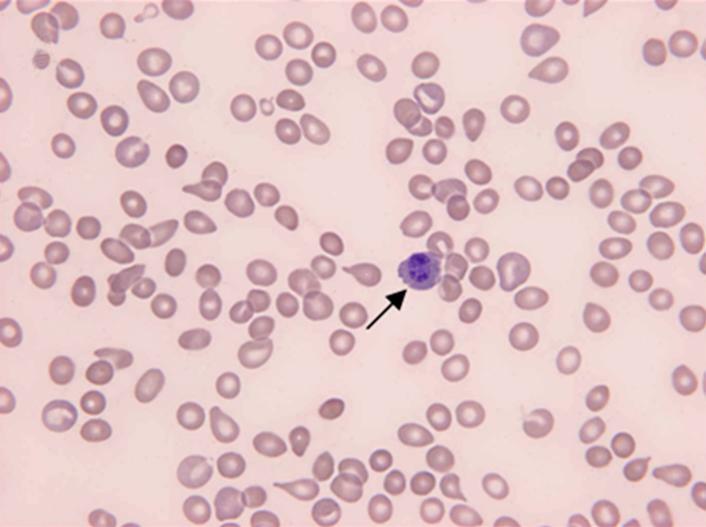 Blood and bone marrow findings of the patient at diagnosis. 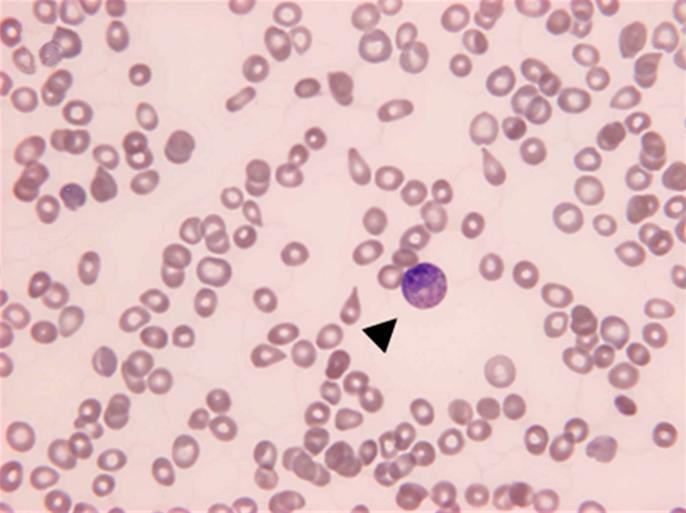 (A, B) Peripheral blood smears showed marked anisopoikilocytosis with tear drop cells and spherocytes, and leukoerythroblastosis with a nucleated RBC (arrow) and a myelocyte (arrowhead) (Wright-Giemsa stain, 1,000). 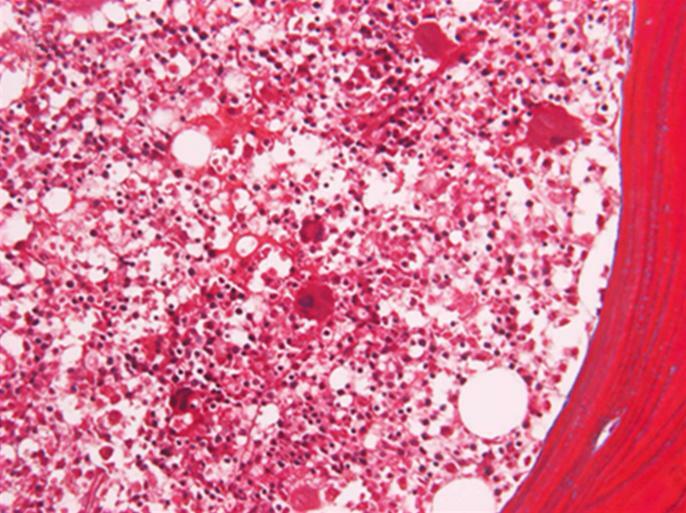 (C) The touch print smear showed erythroid hyperplasia without myelodysplastic features (W right-giemsa stain, 1,000). 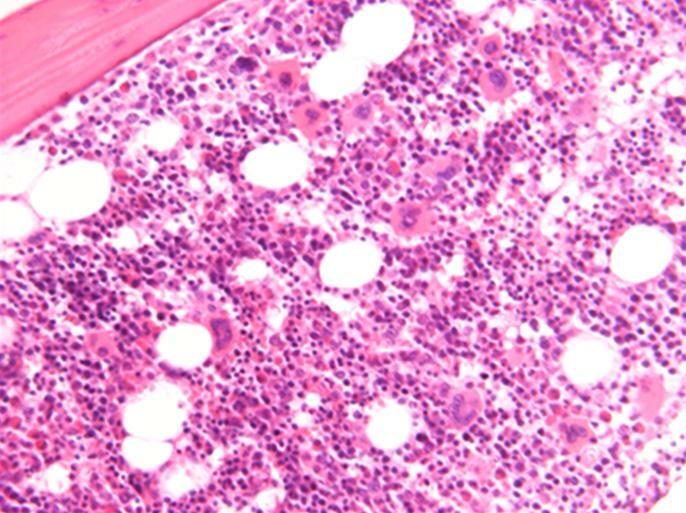 (D) The bone marrow biopsy section showed normocellularity with erythroid and megakaryocytic hyperplasia (Hematoxylin & eosin stain, 400). 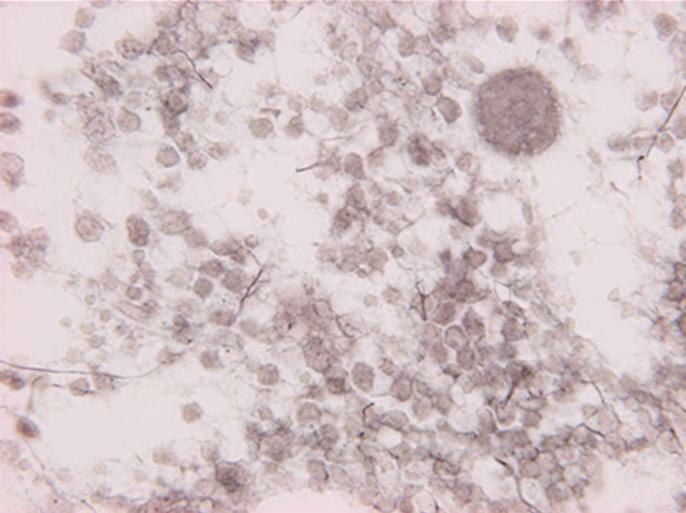 (E) The reticulin stain showed diffuse reticulin fiber network with scattered coarse fibers (Reticulin silver stain, 400). 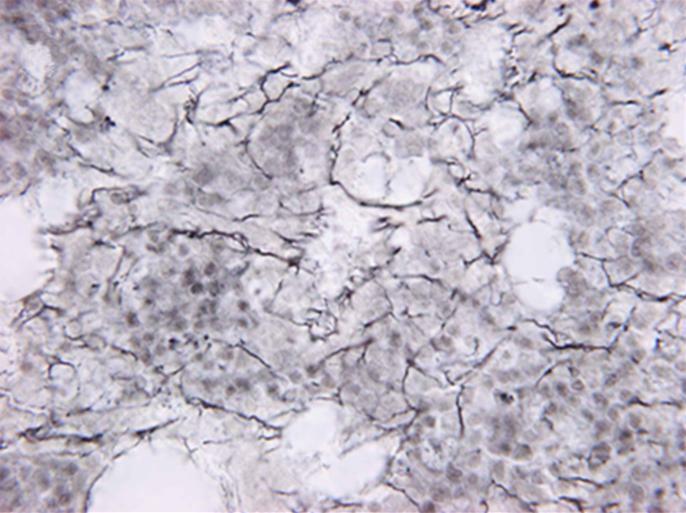 (F) trichrome stain (Masson s trichrome stain, 400).